Accidentally Homeschooling...and beyond: Five Question Friday: Cooking, silence, ugly toes and a wall? 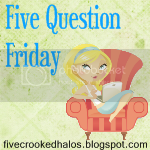 Five Question Friday: Cooking, silence, ugly toes and a wall? It's Friday again? This day keeps coming up, like every 7 days? Time flies. If you want to play, hop over to Mama M.'s. and link up.If you don't have a blog yet, leave your answers in the comments.I'll share my blog. That's laughable! There was a time when I was dating the Gman, he actually owned and used a crockpot. That was before post-ring amnesia syndrome set in. Gone are the those days. I am sure if he became hungry, he may cook well enough to survive. I am not claiming to be a good cook, just a better cook then he. My mom passed away in 2008, so I don't talk to her. Before that it was a few times a day. I am usually adventurous when I am too lazy to run out and buy something that I need. I do like to try new recipes when I have company. I know that's crazy, but I need new guinea pigs since I am surrounded by the meat and potatoes, don't let the food touch gang. Yes, and it a sign of great intelligence. 5. Do you dress up for Halloween? No, but I may dress up this year. Our church is having a Bible character contest. I'll be helping out at the party and I may want to join in the fun. Little guy needs a prop, the walls of Jericho. I may be a gray wall. Don't laugh, my boys won last year as the 10 commandments. Originality can help at my church of overachievers. Have a great weekend, I feel some honey do lists coming on. I hope the Gman is ready. Love your answers! I enjoy participating in this too! And, I show you as following me on Google Friend Connect...I've changed where my blog is and would appreciate you following the new blog. It is http://homeschoolblogger.com/guidinglight/. Have a wonderfully blessed day!